Cubase SX v3.1 enables you to define external instruments in the VST Connections window, meaning that you can work with them inside Cubase in exactly the same way you would VST Instruments. We investigate the major and minor new features on offer in Cubase SX/SL 3.1. Last year's Cubase SX 3 release was perhaps the most significant version of Cubase SX to date, and while it offered a mature feature-set for the most part, there were still a few areas that could have been fine-tuned. However, Steinberg have been listening and, by the time you read this, Cubase SX 3.1 should be available as a free upgrade for SX3 users, with a similar update for Cubase SL users to follow. One of the headline (SX-only) new features is the second phase of Steinberg and Yamaha's Studio Connections initiative, dubbed Studio Connections Audio Integration, making it possible to integrate external MIDI instruments into the Cubase environment and use them in the same way as if they were VST Instruments. This is achieved in a similar way to integrating external effects units into the VST Mixer (a feature introduced in SX3), via a new External Instruments tab in the VST Connections window. Here you can specify the external MIDI device that will receive the MIDI data, and the inputs on your computer system's audio hardware to which the outputs of the device are connected. Once the configuration is done, you can choose this external instrument via the VST Instruments window and Cubase will create a mixer Audio Instrument channel for its output. The external instrument is now functionally identical to a VST one (you can route its audio around the VST Mixer, using insert and send effects, for example), with the exception that you can only use one instance of each external instrument in a Project. 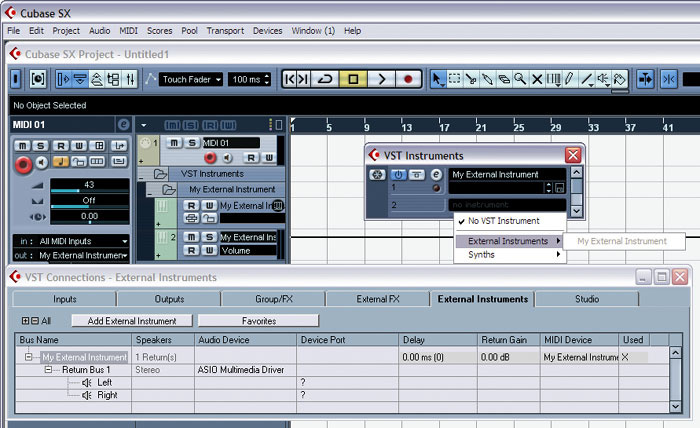 The external instrument's editor will be a Device Panel, if one has been assigned, and the VST Connections window allows you to make delay adjustments to compensate for any latency. Acknowledging the fact that many people use Key Commands in Cubase, it's now possible to carry out certain actions in the VST Mixer via Key Commands. This includes bypassing EQs, sends and inserts, loading and saving mixer and channel settings, configuring metering and toggling visible channel types. Usefully, you can also specify whether Key Command actions should affect all channels in the mixer, with the ability to exclude input and output channels, or just the selected channel. Other improvements to the mixer include the ability to disable the pan control on an audio-based channel by Alt/Option-Shift-clicking it, and there's also a new Equal Power mode in the Project Setup window's Pan Law settings, where the power of the signal remains constant no matter what the pan position — useful for smoother-sounding pan movements across the stereo or surround field. Another welcome enhancement is the ability to copy and paste the settings of multiple mixer channels in one go. Finally, SX now supports Nuendo 's optional Dolby Digital and DTS encoders. Once installed, extra options are added in the Export Audio Mixdown for these formats. As usual, this update is packed with smaller features that are as significant as the headline grabbers — certainly in that they aid workflow and improve usability. The first of these will be welcomed by those who remember 'classic' Cubase and the ability to glue multiple parts simultaneously: yes, you can now do this in SX/SL: select the parts you want to glue together on the same track and click with the Glue tool, or Alt/Option-click a part with the Glue tool to join that part to all successive parts on the same track. There's also a Preference for automatic colouring of tracks — something I've definitely wanted — and, on the subject of aesthetics, another new one for enabling cross-hair lines to appear when you're dragging Objects around the Project window. If you find yourself working with Automation tracks, you might find the new Track Folding features useful. These are accessible from a new Track Folding sub-menu in the Project menu, or via Key Commands. The Toggle Selected Track command shows and hides Automation tracks for the currently selected track, and the Show Used Automation and Hide All Automation commands have been moved into this sub-menu as well. Fold and Unfold Tracks closes or opens all Folder tracks in the Project, and the former option works in conjunction with a new preference called Deep Folding, which closes all Folder tracks within a Folder track. Still on the subject of Automation Tracks, there's now an Extract MIDI Automation feature, for converting controller data into Automation data on a track. Another of the new features is great for those who work a lot with time signatures and tempo changes, especially when writing to picture. This is the Process Bars window in the Tempo track. Generally speaking, Process Bars is to musical time what Process Tempo is to linear time, and enables you to insert, delete, reinterpret or replace bars within a specific range, keeping track of any tempo and time-signature changes in your Project. Overall, Cubase SX/SL 3.1 is a tremendously useful update that will be warmly welcomed by current users of v3. If you haven't upgraded from SX1 or SX2 yet, now might be a good time.